Alexandria Bat Control, Bat Removal, Bat Exclusions, and Bat Cleanup! Alexandria Bat Control experts specialize in all types of bat problems throughout Alexandria, Virginia. Bats are common nuisance wildlife problem in Alexandria. Why you may ask? We may not think that a large metropolitan areas such as Alexandria would have bat problems but its an ideal location because of its close proximity to the Potomac River. The river offers bats an unlimited amount of food source for bats. Bats are capable of eating over a thousand mosquitoes an hour. Misquotes are the largest food source that a bat has and river and creeks are full of them, making Alexandria an ideal place for them to thrive! Call our Wildlife Pros to have any problem your experiencing solved. We provide bat removal and bat control services throughout Alexandria and surrounding areas of Northern Virginia. The two most common bats of Alexandria VA are the Big Brown Bat and the Little Brown Bat. The photo above is of a Little Brown Bat. This is one of the more common bats of Virginia and the most common bat that we find in attics of Alexandria homes. If you discover a bat in the house more than likely they are coming from your homes attic. These bats are notorious for finding the smallest imperfection in your home and taking advantage of it. Once the bat finds an entryway into your attic, it will then lead this entire bat colony into the home. One bat can quickly escalate to 500 to 1,000. The last thing you want is 1,000 Little Brown Bats living in your Alexandria home! Our Wildlife Pros technicians will come out to your home and do a complete inspection of your homes exterior and interior attic space. Once the inspection has been completed the technician can verify the presence of bats, their entry point and best method of removal. Bats are federally protected and must be removed humanely. An inexperienced person may harm bats, or create bigger problems by forcing the bats into the living space of a home. On numerous occasions we have seen a handyman attempt to get rid of a homeowners bat problem and form them into the living space. This is very dangerous for the homeowner. Bats are rabies vector and should always be treated as if they are a positive carrier of bats. 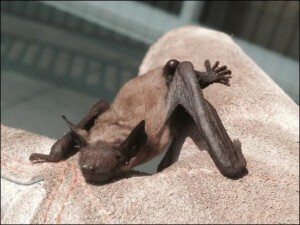 In addition to the dangers related to rabies their is also the danger of Histoplasmosis found in bat guano or bat poop. If you are found to have Bats in your Alexandria homes Attic, Wildlife Pros provide services to remove them. Bats are removed by a method called an exclusion. This is the safest most humane way to remove a bat. Bats are forced out of the attic naturally then the home is “Bat Proofed” to permit the animals from reentering. In the Wildlife Removal industry this is called a Bat Exclusion. If you click on the bat exclusion link we will go into detail in exactly what a Bat Exclusion is and the proper way it is performed. A bat exclusion can be performed any time of year in the State of Virginia. Although the State of Virginia Game and Inland Fisheries require a person to have a Nuisance Wildlife Permit to perform any type of Bat Work and Bat Exclusions. Also, make sure that the company you hire carriers the proper general liability insurance to perform Bat Removal Services in Alexandria, VA.